Lampwick is a character in Disney's 1940 animated feature film, Pinocchio. He is based upon the character Lucignolo ("Candlewick") from the Italian story Pinocchio by Carlo Collodi. Although not confirmed specifically, Disney chief animator Fred Moore is credited for the appearance of Lampwick. Moore, who was responsible for the character's story arc, is believed to have added the red hair and buck teeth as a caricature of himself. He is a tough, older boy from the streets, who becomes friends with Pinocchio on their way to Pleasure Island. Based on the description of him from The Coachman, he was most likely chosen to go to Pleasure Island due to his bad behavior. He laughs at all forms of authority, preferring to engage in more crooked activities like drinking and vandalizing. Lampwick, in terms of personality, is a complete delinquent. He fully enjoyed the events in Pleasure Island and gladly took part of all of it. He was friendly towards Pinocchio however, acting as his friend while they were at Pleasure Island together while they played pool and took part in some of the activities and even gives Pinocchio a friendly nickname. He is, however, rather disrespectful towards Jiminy Cricket, despite the fact that Jiminy was just trying to help. He can be considered a jock as he was able to shoot a pool ball from an awkward angle and somehow was able to cause the cue ball to make a group of pool balls stacked on top of each other. However, when he realized he was becoming a donkey, he displayed absolute terror and desperation, calling for help from anyone including Jiminy and his mother. As a human, Lampwick is a tall and slender boy immediately identifiable by his red hair and buckteeth. His outfit consists of a formal brown jacket and yellow vest with a green ascot over his white shirt, complemented by olive green pants with suspenders and a pair of brown shoes. He also wears a bowler hat with a single feather in it. Upon turning into a donkey, he loses these and his trademark red hair. Lampwick meets Pinocchio on the Coachman's Stagecoach, and the two quickly become fast friends. Though Lampwick has never been to Pleasure Island, he has heard great things about the fun they can have there. Pinocchio and Lampwick spent their free time roughing up other boys, smoking, eating, drinking beer, and playing pool. Lampwick was more experienced at these activities and goads Pinocchio into doing the same, such as vandalizing a model home, then praising Pinocchio when he throws a brick through a stained glass window. At the pool hall, it becomes apparent that they seem to be the only boys left at the park, though Lampwick doesn't seem to care, and doesn't even suspect anything to be awry. When Jiminy Cricket arrives at the island trying to convince Pinocchio to leave after Jiminy scolds Pinocchio for doing the wrong things again, Lampwick is quick to shoot him down, stating Pinocchio was foolish to "take orders from a grasshopper". Jiminy is insulted, but Pinocchio defends him, saying that Lampwick is his best friend. After Lampwick continues to harass him, Jiminy leaves the two boys in a huff. In one of the more frightening scenes, while he and Pinocchio are playing pool, drinking, and smoking, he and Lampwick start transforming into donkeys. First, Lampwick grows donkey ears, a tail, and his head completely transforms. The transformation is not painful, as evidenced by Lampwick's ignorance of his condition. However, this also creates a paradox in the film: Pinocchio does notice when his ears and tail grow in, even though Lampwick does not. It is theorized that Lampwick's overly-intoxicated condition led to his ignorance of the changes. When Pinocchio sees Lampwick's ears grow into donkey ears, he becomes suspicious and immediately stops drinking. The transformation continues as Lampwick then grows a donkey tail (ripping through his pants), complete with a long hairy black tassel that sweeps across the floor, prompting Pinocchio to stop smoking. After Lampwick's head completely changes, Pinocchio laughs at him when Lampwick asks if he looks like a "jackass," because he literally does. Lampwick doesn't notice these changes until he accidentally brays while laughing at Pinocchio, who had also brayed by accident when laughing at him. He covers his mouth with terror and asks "Did that come out of me? ", to which Pinocchio nods. Lampwick then touches his mouth and notices it feels different. Then he touches his face and feels it covered in hair; finally, he feels his ears only to find that they have grown longer. He immediately grabs them, sees this change and asks what is going on. When he sees that he is now half-donkey in a mirror, he panics and screams for somebody to help him. All the while, Pinocchio was watching the whole thing, but had no idea what to do and could only watch frozen with fear. Lampwick begs Pinocchio to "call that beetle, call anybody", not realizing that Jiminy, having learned of the island's curse, was already on his way. Then Lampwick's hands and feet become hooves, and he grows reddish brown fur all over his body. Lampwick cries for his mother, but is forced onto four legs and completes his transformation into a donkey. He also loses his ability to speak and begins braying and kicking wildly. He destroys the pool hall with his hind legs, kicks his clothes off, and then flees the scene braying in terror. Lampwick makes a cameo in the film in a Toontown poster advertising for smoking cigarettes with his donkey ears and tail from the original Pinocchio film. Lampick is seen in the episode "Jiminy Cricket", sitting along with Honest John and Gideon. As Jiminy gives out his poem, his ears turn into that of a donkey. As part of the Disney Dreamers Everywhere special event in 2013, Lampwick appeared alongside Pinocchio, Geppetto, Honest John and Gideon as a walk around character for a special meet and greet at Walt Disney World. He also has been seen with one of The Stupid Little Boys, sporting donkey ears and tail for the Disneyland Main Street Electrical Parade. Other than that, he hasn't been a meetable character. The Disney Wiki has a collection of images and media related to Lampwick. Lampwick ('Lucignolo') had a somewhat larger role in the original story of Pinocchio in that it is he, and not the Fox and the Cat (the original counterparts of Honest John and Gideon) who tempts a reluctant Pinocchio into going with him to Pleasure Island (here called 'Toyland'). In the book, he was sold to a farmer. Pinocchio later gets a job as a farmboy at the same farm and recognizes his former friend. Unfortunately, by this point he shortly died afterwards from being worked to death. In the book it was mentioned that his real name is Romeo but he was called Lampwick for his slender appearance. As he transforms into a donkey his clenched fists turn into hooves, even though in real life a donkey's hoof only corresponds to a human's middle finger. As shown in some early concepts/sketches of Lampwick after transforming into a donkey, he was originally supposed to escape Pleasure Island with Pinocchio and Jiminy Cricket but was captured by the coachman or his minions and advises to Pinocchio to escape without him. 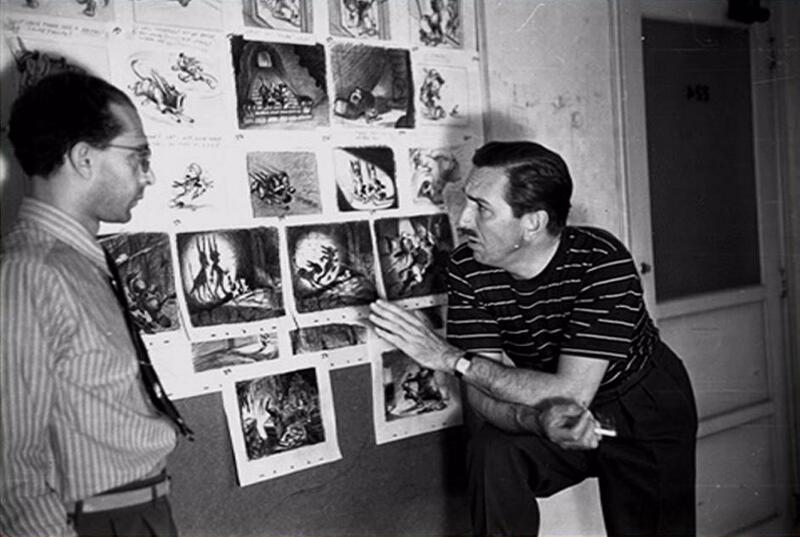 That scene can be overlooked in this picture where Walt Disney appears looking at the storyboard. Some storybook adaptations keep this concept. Lampwick doesn't appear on Once Upon a Time. However, when Pinocchio comes with the baby Emma Swan in the Land Without Magic, the character of Gordie serves as an allusion to him. It is he who entices Pinocchio to stray from his path to protect Emma and leave the orphanage, similarly to how Lampwick leads Pinocchio astray in the film. It can be assumed that he was one of the boys Honest John and Gideon brought to the Coachman as he can be heard whistling "Hi-Diddle-Dee-Dee" as he plays pool in one scene.